What is there to see in Nagoya? What is Nagoya famous for? I did do a lot of research and planning for this trip. But, when it came to Nagoya, my to-see list included things like, the science museum, a car museum, and an aquatic museum. All of which are great if you are into that sort of thing. Neither Mark nor I are. When we started our day we both realized that we weren’t into any of that stuff. We wanted to do things that can only be done in Nagoya. But we could not come up with anything that Nagoya is famous for. “There must be something. 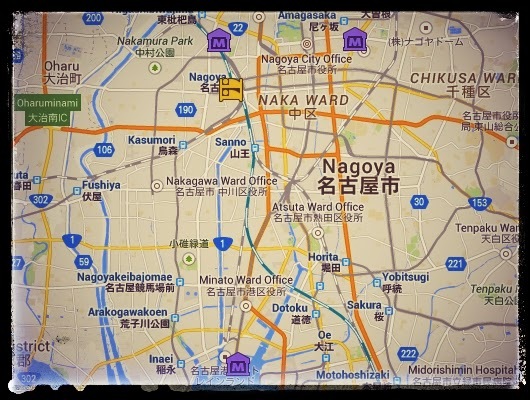 I had heard of Nagoya, even before living in Japan. It must be famous for some reason.” But we couldn’t find a thing. 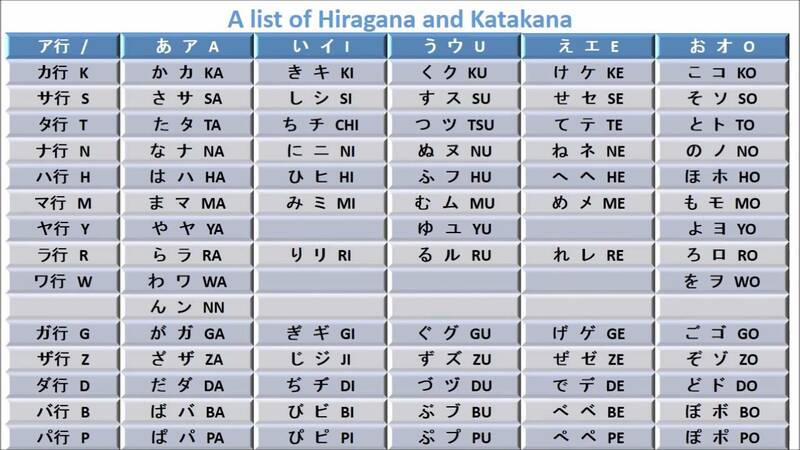 Nagoya was the Charo of Japan. We’ve heard of it, but we just don’t remember why. We would have gotten the ￥500 pass for the Nagoya city sightseeing route bus if we had stuck to the original plan. On that route we would have seen many of the city’s museums as well as Nagoya castle, gardens, and a plethora of temples and shrines. But none of that sounded appealing or unique. 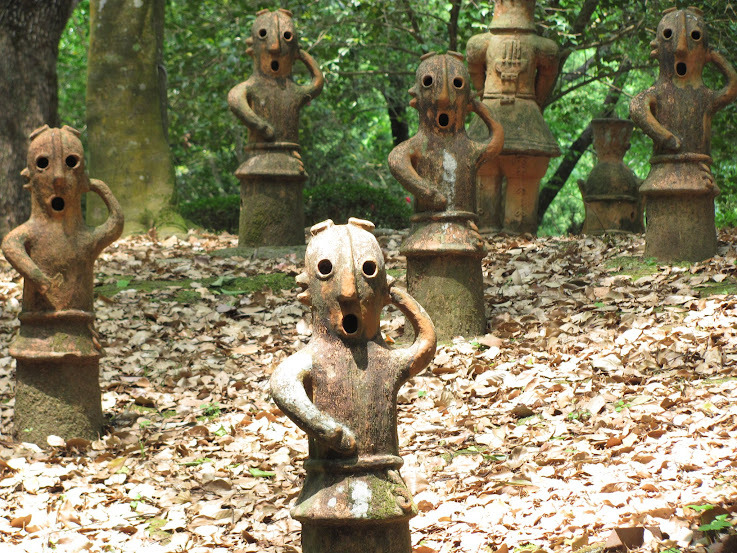 Every city in Japan has temples, shrines, castles, and gardens. We’ve seen so many of those that we no longer care to see any more. What can we only see in Nagoya? We spent a good hour and a half at Nagoya station trying to come up with a new agenda for the day. At one point a cop came over and gave us his confused two cents. His English was fine, he just could not get over the fact that we didn’t want to see the castle or the gardens or any of the shrines. He is worth his weight in ￥10,000 ($100) notes. Japan used to put a fat man with a sack of money sitting on another sack of money on their money. I enjoyed the money museum and learning about the history of Japan’s money printing and minting. You can find out what your height weight in money are. Though, I generally have a policy against being weighed in public. After the money museum, we stood on the street for about 30 minutes arguing about what we should see next. Mark gave up on doing or seeing anything unique to Nagoya and wanted to just go to the castle, a temple, or a shrine. But, I didn’t want to. All castles, temples, and shrines generally look alike and are a bit boring. 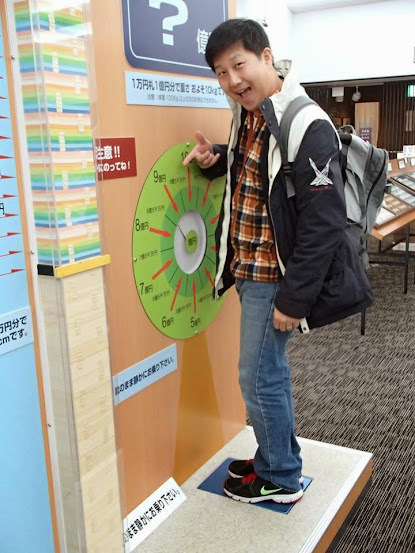 The science museum was the only thing that we both agree would be interesting, but the admission fee of ￥800 was a little too high to chance not being able to read anything. If they had English translations, fine. But if it was all in Japanese, we thought that the entrance charge would be too high. So we contemplated just going there and asking. In the end we got cold and just hopped on the next bus back to Nagoya station. The new plan was to get off when we saw something interesting. From here we can see all that Nagoya has to offer. We ended up on the Sky Boat, a Ferris wheel in downtown Nagoya. We took out our map of the city and looked at our view to see what we could do next. That’s when we spotted the Spaceship Aqua. I wasn’t quite sure what it was, but it looked interesting. I’m still not sure what the Spaceship Aqua is all about. I think it started as a bus station that turned into a mall and it’s now a multi-leveled piece of art that encourages people to exercise while getting fresh air. Whatever it is, I liked it! Mark, I’m not drunk or old enough to go to Denny’s. It’s for the mall walkers. When Mark saw the Denny’s the night before he demanded to eat there. I wasn’t too keen. “It’s for old people,” I told him. But, he was feeling home sick and wanted to eat at an American diner. Well, so did half of Nagoya. The place was crowded and there was a long line of people waiting to be seated. We put our names down for a table and waited for about 40 minutes. It was about 14:00. Come to think of it, when we passed the Denny’s the night before at around 22:00, the place was packed then too. There were no typical American diner dishes on the menu. I had a Japanese version of an Italian dish and Mark had a Japanese version of a Chinese dish. While I waited I wrote out several postcards to be sent to friends and family back in the US. I know it’s easier and faster to upload photos on Facebook, but I still like mailing postcards. I used to mail a postcard to my Aunt Audrey and Uncle Mike every time I took a trip. But I stopped doing that a few years back. Now, I’d like to get back into the habit of it again. We had another long drive to the tiny city of Hamamatsu. I wanted to make sure to leave Nagoya by 15:30 so we could avoid driving at night on some lonely back road. Japanese roads in the winter in small towns can be a little tricky. There are no street lights and most towns do not salt their roads. And there are always those drivers who just don’t understand why other people slow down when the road gets a little icy. 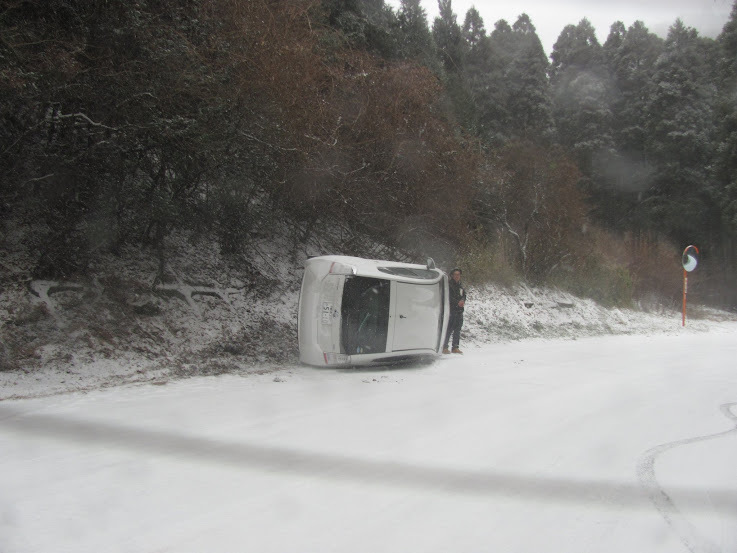 (Winter 2010 Yufu, Oita-ken) I wanted to avoid drivers like this guy. I never understood those idiots who don’t slow down in bad weather. There were many times that I have slowed down significantly because I could not see the road very well, or because I knew that there is a chance I could hit some icy patch of the road and lose control of the car for a few seconds, only to see some driver honking at me annoyed as they over take me. Once, 20 minutes after being overtaken by 4 of those types of jerks at the top of a hill, I slowly passed all four of them when I got to the bottom. They had all crashed into each other and were scattered along the road and in ditches. Those foolish fools. 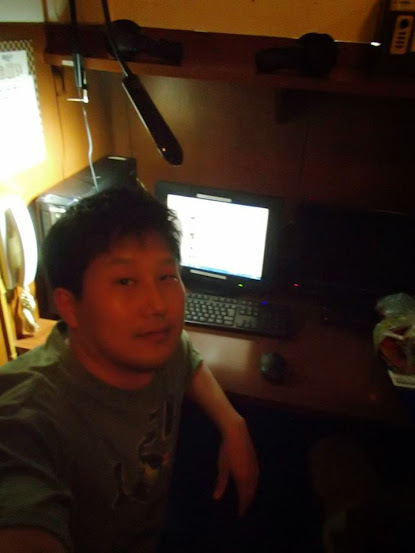 To sleep or to internet all night long, that is the question. We got to Hamamatsu safely and spent the night in an internet cafe. This little town had no hostels or hotels on hostelworld.com. I could find no accommodations that advertised online at all, except for good old Popeye’s Media Cafe. We got 2 cubicles with a 10 hour special for ￥2,100 each. He’s going to do this all night! 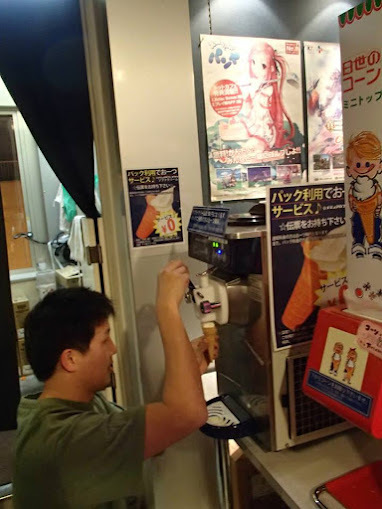 We spent the first couple hours sampling all the free drinks at the drink bar and eating ice cream cones. Then we took showers and went to bed after watching a thousand YouTube videos. I had set my alarm for 5:30 the next morning. We had to check out by 6:00 and I didn’t want us to over sleep. But, there was no need to worry. The 5 gallons of coffee, tea, and soft drinks I had before bed made sure that I woke up several times that night to pee. Then some guy, in a cubical near us, set his alarm for 4:30, but he slept right through it. It kept beeping until 5:45. I hope he got charge a lot extra for missing his check-out time! Next to the Denny’s by Nagoya Station. There is closing time when there is no receptionist, but I don’t know when that it. The nearest cheap parking is near the MaxValu grocery store nearby. This is not a hostel, so there is no kitchen but they do have electric kettles in the hall way. They do have a coin laundry in the basement near the showers. They have some video presentations in English. The bus terminal is below or near this.